I was recently reading the Genea Musings Blog by Randall J. Seaver where someone asked him why he uses “Census Fact” instead of other categories of Residence, Occupation, and other facts. His response got me to thinking. Why do I use Residence, Occupation, and Education facts instead of “Census Fact?” I came to the conclusion it was mostly because when Ancestry.com creates a fact based upon a census record it automatically makes the fact a Residence Fact. Afterwards I typically add Occupation, Education, and other facts based upon what I think of as important for that particular person and their census data. I agree with Randall’s reasons for using Census Fact. It is a snapshot event, information told by one person to another person regarding a family at one given time. The data may, or may not, be accurate because it must be considered secondary information. Anyway, I like it and plan to use “Census Fact” for my future entries. That will then keep all the information together regarding the instant in time known as the Census. Thank you Randall Seaver for the suggestion. Caroline must have been something of a surprise to her parents, Thomas A. and Martha (Cannon?) [Liggon] Pankey. In the 1810 Census Thomas is over 45 and it appears that his wife Martha is as well. It appears that some of their children were in there 20s and possibly married when Caroline was born in 1811-12. That would explain the household of at least eight other white people living there. They had to have been fairly well off financially as the family had four slaves. Some researchers indicate that Caroline was also known as Margaret, some as Martha; however, all of the documents I have found indicate her name as Caroline. I concede that the “M” in her name probably stands for Margaret or Martha. 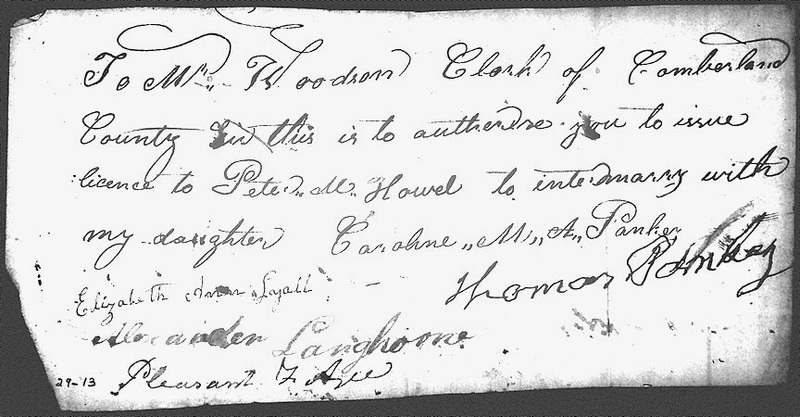 Marriage permission clearly written by one person and then signed by Thomas Pankey. Thomas died about a week after signing this document. Nothing is known of Caroline’s childhood. The 1820 Census is very confusing. The Pankey’s appear to have three children living at home but the 8-9 year old Caroline doesn’t appear to be enumerated. We do know that when she was “about 17” her sick father gave permission for her to marry Peter M. Howell. On 11 June 1829, they were married in Cumberland County, Virginia. We also know that her father died about a week later. If Caroline was the youngest of Thomas’ children, it would make a lot of sense that he wanted to assure that Caroline would be taken care of after he departed. raising the children with Peter gone so much. In addition, they moved frequently. I am sure of the following moves. 1830 – Lived in Cumberland County near Farmville, Virginia. information regarding Caroline or Peter either. for clues to their life. History Library Film: 0181428. Record for Thomas Pankey. Cumberland, Virginia; Page: 106; NARA Roll: M33_130; Image: 204. http://search.ancestry.com/cgi-bin/sse.dll?db=1820usfedcenancestry&h=20245&indiv=try. North Carolina; Roll: M432_633; Page: 37B; Image: 80. Next Next post: Memories – Kid Shows and Poker with Grandma.